The IIIB’s Foundation’s 8th Annual Breast Cancer Charity Golf Classic Another Big Success! Thank You to all our Generous Sponsors and Attendees! 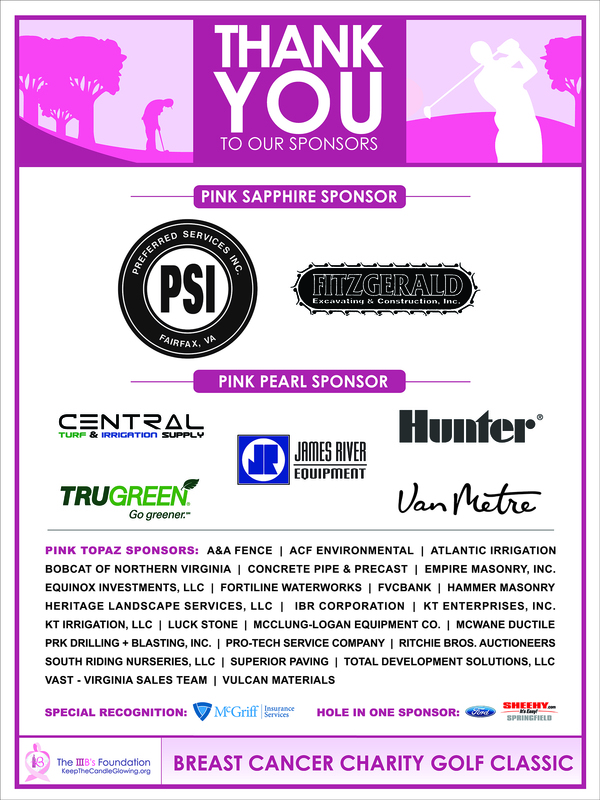 Loudoun-based IIIB’s Foundation raised $90,000 at its Eighth Annual Breast Cancer Charity Golf Classic at Bull Run Golf Club. Proceeds from the sold-out event will further the organization’s mission to provide comfort from the pain associated with breast cancer surgery. The IIIB’s Foundation gives Bosom Buddy Baskets to comfort breast cancer patients when they wake up in the hospital following mastectomy surgery to let them know they are not alone in their journey. “This tournament is not only a great way for local companies to gather and fundraise for the IIIB’s Foundation, but also a great way for the survivors to come out and strengthen their community as well,” said Carolyn Rodenburg, founder of IIIB’s Foundation. The “IIIB’s” of IIIB’s Foundation stands for Bosom Buddy Baskets. The baskets are personally designed and assembled by volunteers and are inspired by breast cancer survivor, Rodenburg, who left her lucrative career to dedicate her life to helping other cancer victims during their darkest hours.